Can you see a "4" hiding in this simple collage? 1. Gather your material. 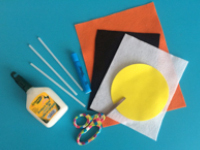 You will need orange, black, and white felt, a yellow Fun Foam circle, three drinking straws, scissors, a blue marker, white glue and/or hot glue. 2. 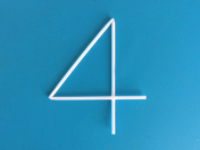 Insert the three drinking straws one inside the other and then bend them to represent a "4". Apply a dot of glue on the vertical line to hold the straws in place. 3. 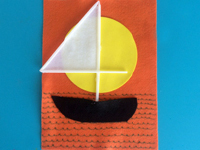 Trace the triangle you created on the white felt and cut it out to represent a sail. Glue the sail inside the triangle as shown. 4. 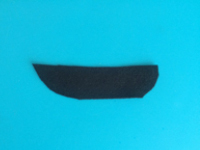 Cut the base of your sailboat out of the black felt. 5. Glue the yellow Fun Foam circle on the orange felt to represent a sunset. 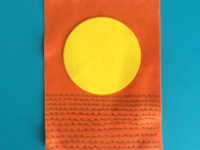 Use the blue marker to draw waves on the bottom portion of the orange felt. 6. 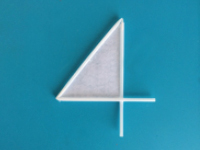 Glue the number "4" over the sun and glue the base of your sailboat on top of the lower extremity of the number "4", in the water. Use this simple craft to introduce children to marine transportation and explore number "4".